Fernanda Fragateiro, To Think Is to Destroy (detail), 2013, mixed media, dimensions variable. Fernanda Fragateiro’s practice is invariably about studying a particular space or situation and intervening in it, her objective often being to direct attention to the unquestioned. 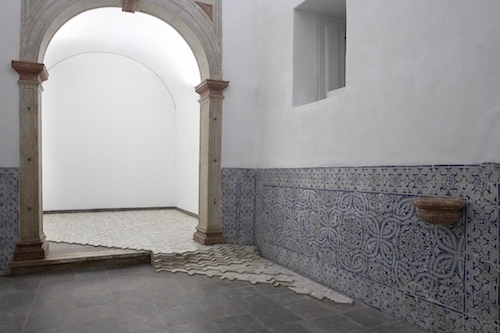 In the case of her installation To Think Is to Destroy, 2013, the floor of Ermida de Nossa Senhora de Belém, a eighteenth-century chapel, is the object of her attention. While the chapel is almost entirely in its original state, during the 1980s the floor was redone in a gray Portuguese marble. This material is noticeably different than those used in the church’s initial construction, so much so that the marble almost seems like an intruder. It is precisely this discrepancy that inspired To Think Is to Destroy. Fragateiro has laid three thousand white mosaic terra-cotta tiles over the altar and the nave. These two areas are separated by a ten-inch-high step, yet the tiles, starting in the higher level and spilling to the lower space, effectively create the illusion that the spaces are level with each other. Fabricated in Meknes, Morocco, they are made of different types of clay and are glazed in different shades of white; this is not a monochromatic ground but a space that approaches the look of a drawing or watercolor. At the same time, the layout and materials come together to create historical and architectural relationships: Here is an Arabic floor within a Catholic chapel, which suggests a larger historical narrative space, one that hints at the formation of the Portuguese nation as well as the economic, religious, and political relations between this country and Morocco. The title of the work, To Think Is to Destroy, is part of a quote from Fernando Pessoa’s Book of Disquiet (1982), and lends the work conceptual weight. Curator Paulo Pires do Vale writes in the exhibition catalogue that “the words in the title are also the material that constitutes the work.” These words do not intend to be a moral statement but refer to the idea that thinking is a very active undertaking that alters things from their original state.